Phil was named national Defensive MVP five times during his playing career with the Raiders. He says he owes it all to the players around him. Phil played under coaches Bob Milkie, Kurt Kampendahl, Terry Converse, and Jordan Kopac. A native of Milwaukee, Phil graduated from UW-Platteville with a bachelor’s degree in mechanical engineering. While at Platteville, he played offensive and defensive tackle, defensive end, tight end and offensive guard, earning All-Conference and All-District honors along the way. Phil works as an automation engineer at Nelson Electric Supply Company, where he sells and supports high-tech equipment. 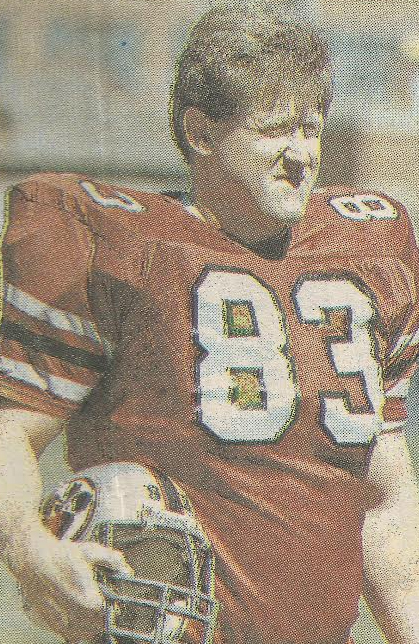 His claims to fame, he says, are that he once wore the same jersey number as special teams coach Tom Kohr…and that “Bob Milkie could never block me.” His collection of original Racine Raiders songs is legendary (“If You Can’t Block Me By Now,” “83,” “Wedge Divider,” “How Can We Play Defense If We Can’t Play End,” and more), just ask him. His favorite food is steak, his favorite movie is Hoosiers, and his favorite book is the Bible. Phil counts his blessings while he continues to recover from an illness that has him walking with a cane and hoping that he will one day be able to run again. Phil’s number was retired in 2001.